The primary goal of this lesson is to show that you can think of writing functional programs as being like writing Unix pipeline commands. Stated another way, if you’ve written Unix pipeline commands before, you have probably written code in a functional style, whether you knew it or not. Note: This section is written for Unix and Linux users. If you don’t know Unix, (a) I highly recommend learning it, and (b) you may want to (sadly) skip this section, as it may not make much sense unless you know the Unix commands that I show. One way to think about FP is that it’s like writing Unix/Linux pipeline commands, i.e., a series of two or more commands that you combine at the Unix command line to get a desired result. For example, imagine that your boss comes to you and says, “I need a script that will tell me how many unique users are logged into a Unix system at any given time.” How would you solve this problem? who’s output is well structured and consistent. It shows the username in the first column, the “console” they’re logged in on in the second column, and the date and time they logged in on in the last columns. Some Unix systems may show the IP address the user is logged in from. I left that column off of these examples to keep things simple. If you didn’t have to automate this solution, you could solve the problem by looking at the unique usernames in the first column. In this case there are four lines of output, but only three of the usernames are unique — al, joe, and tallman — so the current answer to your boss’s question is that there are three unique users logged into the system at the moment. Now that you know how to solve the problem manually, the question becomes, how do you automate this solution? Notice what I did here: I combined two Unix commands to get a desired result. If you think of the who command as providing a list of strings, you can think of the cut command as being a pure function: it takes a list of strings as an input parameter, runs a transformation algorithm on that incoming data, and produces an output list of strings. It doesn’t use anything but the incoming data and its algorithm to produce its result. field: Int): Seq[String] = ??? To finish solving the problem, all I need to do is to keep combining more pure functions — er, Unix commands — to get the desired answer. That is, I need to keep transforming the data to get it into the format I want. Whoops. What’s that 3 doing way over there to the right? I want to think of my result as being an Int value, but this is more like a String with a bunch of leading spaces. What to do? Well, it’s Unix, so all I have to do is add another command to the pipeline to transform this string-ish result to something that works more like an integer. That looks more like an integer, and it won’t cause any problem if I want to use this result as an input to some other command that expects an integer value (with no leading blank spaces). If you’ve never used the tr command before, it stands for translate, and I wrote a few tr command examples many years ago. The thing that enables this transformation is that all of those expressions in the middle of the original code are pure function calls. I always find solutions like this amusing, because if you have ever seen Lisp code, condensed Scala/FP code tends to look like this, where you read the solution starting at the inside (with getUsers), and work your way out (to cut, then uniq, etc.). Note: You don’t have to use this condensed style. Use whatever you’re comfortable with. Well, if you think of the who command as generating a list of strings (Seq[String]), you can then think of cut, uniq, wc, and tr as being a series of transformer functions, because they transform the input they’re given into a different type of output, as shown in Figure [fig:unixPipelines1]. Looking at just the wc command — and thinking of it as a pure function — you can think of it as taking a Seq[String] as its first input parameter, and when it’s given the -l argument, it returns the number of lines that it counts in that Seq. The one thing that wc did that I didn’t like is that it left-pads its output with blank spaces, so I used the tr command just like the wc command to fix that problem: as a pure function. With that thought, this example looks as shown in Figure [fig:unixPipelines2]. Note a few key properties in all of this. First, data flows in only one direction, as shown in Figure [fig:unixPipelinesDataFlow]. Second, Figure [fig:unixPipelineDataNotModified] shows that the input data a function is given is never modified. 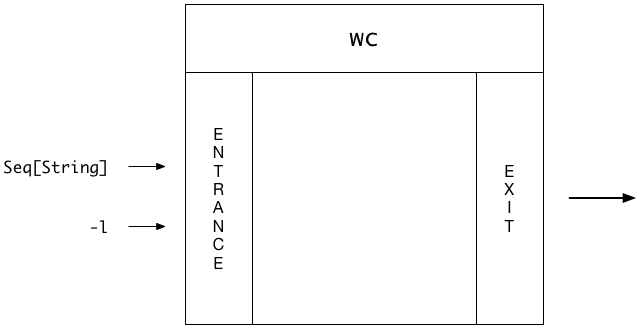 Finally, as shown in Figure [fig:unixFunctionsEntranceExit], you can think of functions as having an entrance and an exit, but there are no side doors or windows for data to slip in or out. These are all important properties of pure functions (and Unix commands). I create what’s called in Unix a pipeline or command pipeline. In FP we call that same thing a combinator. That is, I combined the three commands — pure functions — together to get the data I wanted. We started with the problem statement: wanting to know how many users are logged into the system. We thought about what data source had the information we needed, in this case the output of the who command. At this point should note that implicit in my own thinking is that I knew the structure of the data I’d get from the who command. That is, as an experienced Unix user I knew that who returns a list of users, with each user login session printed on a new line. Depending on your thought process you may have thought of the who output as a multiline String or as a List (or more generally as a Seq in Scala). Either thought is fine. Because you knew the structure of the who data, and you know your Unix commands, you knew that you could apply a sequence of standard commands to the who data to get the number of unique users. You may or may not have known beforehand that the wc -l output is padded with blank spaces. I did not. You start with a problem to solve. You either know where the data source is, or you figure it out. Likewise, the data is either in a known format, or in a format you need to learn. You clearly define the output you want in the problem statement. You apply a series of pure functions to the input data source(s) to transform the data into a new structure. If all of the functions that you need already exist, you use them; otherwise you write new pure functions to transform the data as needed. Note the use of the word apply in this discussion. Functional programmers like to say that they apply functions to input data to get a desired output. As you saw, using the word “apply” in the previous discussion was quite natural. As a second example of both “Unix pipelines as FP,” and “The FP thought process,” imagine that you want a sorted list of all users who are currently logged in. How would you get the desired answer? Let’s follow that thought process again. I’ll give you the problem statement, and everything after that is up to you. Problem statement: I want a sorted list of all users who are currently logged in. Write a pipeline to show the number of processes owned by the root user. Use the lsof command to show what computers your computer is currently connected to. Write a pipeline command to show which processes are consuming the most RAM on your computer. Write a command to find the most recent .gitignore file on your computer. Besides demonstrating how writing Unix pipeline commands are like writing FP code (and vice-versa), I’m also trying to demonstrate “The FP Thought Process.” Because “output depends only on input,” FP lends itself to something that used to be called “Data Flow Diagrams” — or DFDs — back in the old days. There’s a formal notation for DFDs, but I don’t care for it. (There are actually several formal notations.) If I was going to sketch out the solution to the last problem, I’d draw it like the image in Figure [fig:unixDfdSketch]. 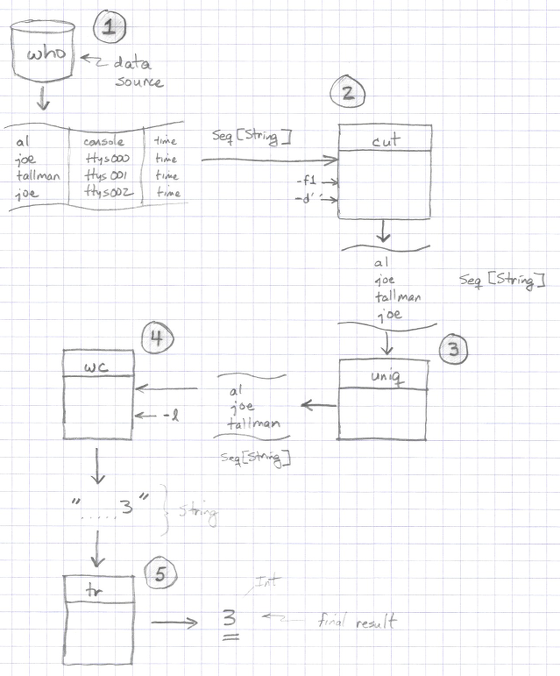 I prefer to draw data flows as streams (simple tables). I like to annotate streams with their data types. I like to draw functions as rectangles (because of the whole front-door/back-door, entrance/exit concept). I’m not suggesting that you have to draw out every problem and solution like this, but if you’re working on a hard problem, this can be helpful. If you take the time to draw the data flows like this, it’s possible to make sure that the “Rule of Data Conservation” is satisfied — at least assuming that you know each function’s algorithm. Just substitute “function” for “process” in their statements, and I really like those last two lines — avoiding black holes and miracles — as they apply to writing pure functions. In this lesson I tried to show how writing Unix pipeline commands is like writing FP code. This is true in that combining Unix commands to solve a problem is like combining pure functions to solve a problem. One part I didn’t show is a program that runs continuously until the user selects a “Quit” option. But fear not, I will show this in an upcoming lesson, I just need to provide a little more background information, including covering topics like recursive programming. You have data sources, or inputs, that bring external data into your application. Unix commands such as cut, uniq, etc., are like pure functions. They take in immutable inputs, and generate output based only on those inputs and their algorithms.